ca. 320 – 310 B.C. Night (Nyx) departs at the approach of Dawn (Eos). 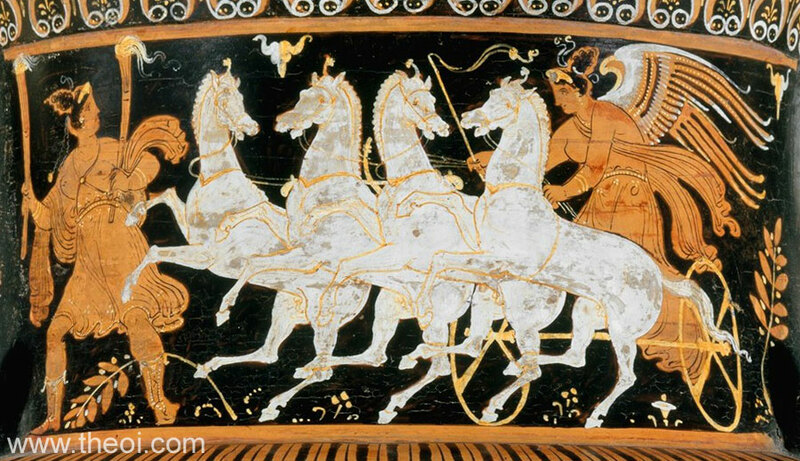 Eos, the winged goddess of the dawn, drives a chariot drawn by four white steeds. Nyx, holding a pair of torches, gazes over her shoulder at the other goddess. Twin torches are the usual attributes of another nocturnal goddess, Hecate, here used to identify the more obscure Nyx. The pair appear on the neck of a vase above a depiction of Amazons battling Greeks.